WPtouch Make your WordPress website mobile-friendly by April 21! Not mobile-friendly? Google is about to penalize you! Since the launch of WPtouch in 2008, mobile web usage has skyrocketed. Around the world ever more customers are shopping, researching, reading, and connecting with their mobile devices. Visitors to websites are becoming ever less tolerant of pinching and zooming, digging through pages overloaded with widgets and sidebars, and waiting for overly complex pages to load. Google has been working for a few years to encourage website owners to prepare for this shift, producing reports and tools to help understand the challenges and opportunities involved. Most recently, Google’s mobile search results began highlighting sites that are optimized for mobile devices. As of April 21, Google will be stepping up their pressure on website owners to be ready for mobile visitors. Starting then, sites that Google recognizes as mobile friendly will be pushed to the top of results when searching on a mobile device. Websites that are not ready for mobile visitors will be penalized with lower ranking in results–meaning less traffic, fewer ad views, and less revenue. 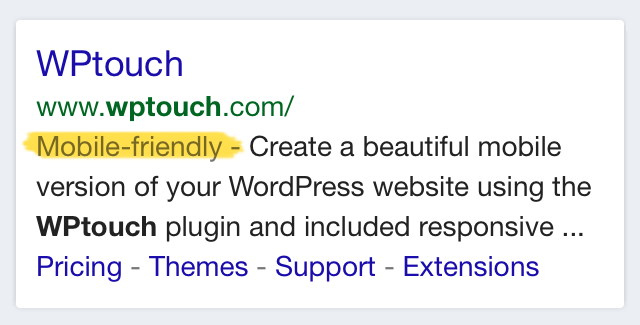 Built on seven years’ expertise in optimizing WordPress websites for mobile devices, WPtouch Pro and all of our themes achieve Google’s “Mobile-friendly” rating. If you want to avoid being penalized on mobile searches on April 21, now is the time to get started with WPtouch, Google’s recommended mobile solution for WordPress website owners.